In 12-inch nonstick skillet, heat 1 teaspoon of the oil over medium heat. Beat eggs, garlic sauce and fish sauce with whisk; add egg mixture to skillet. Cook 1 to 2 minutes, stirring frequently, until eggs are just firm but still moist. Remove to small bowl; reserve. In another small bowl, mix brown sugar, lime juice, soy sauce and pepper flakes. In same skillet, add remaining 2 teaspoons oil; heat over medium heat. Stir in sweet potatoes, bell pepper and green onions. Cover; cook 6 to 8 minutes, stirring occasionally, until sweet potatoes are crisp-tender. Add sauce mixture; stir until vegetables are coated. Cook 1 to 2 minutes, or until sauce has been mostly absorbed. Stir in eggs. Top with cilantro and peanuts; serve with lime wedges. 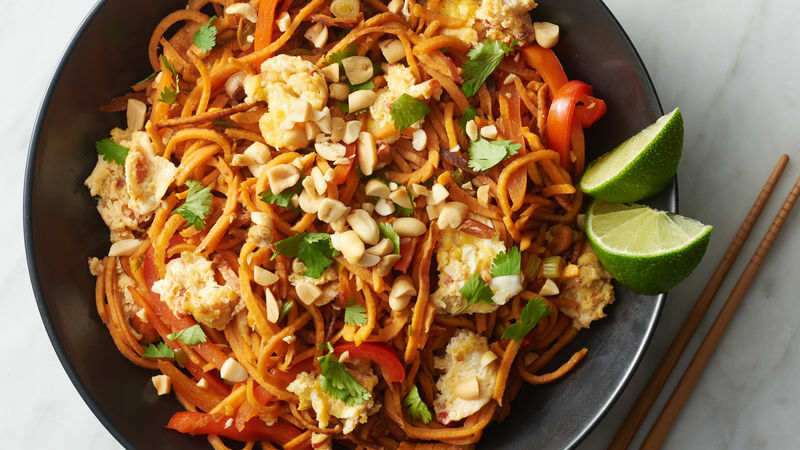 Sweet potato spirals are also called sweet potato noodles or swoodles. If you’re using prespiralized sweet potatoes, measure by the ounce. We used about 16 oz sweet potato spirals in this recipe. If the sweet potatoes start browning too fast, turn heat down, and continue cooking until tender. Chili-garlic sauce is a blend of coarsely ground mild chiles, garlic, vinegar and salt that can be used as either a condiment or a cooking ingredient and can be found in the Asian section of the grocery store.